As male grooming becomes mainstream, we take a look at growing barber industry. Male grooming has become mainstream. With buzzwords like metrosexual and manscaping now commonplace in the English language it’s all just part of being a modern man. It’s not just women feeling the aesthetic pressures of the media. The societal ideal of the perfect male and the ‘Adonis complex’ are having a significant effect on male grooming regimes. 9 out of 10 salons saw an ‘increase in takings from men’ in 2014 and they now make up 'a quarter of customers ... compared to 19 percent a year ago', according to an industry report by Salon Services, which surveyed more than 2,500 salons. Men have become increasingly style conscious and in turn it has been greatly beneficial to the health and beauty sector; with recent years seeing a revival of the barber shop. "Many of us remember when beards, dodgy moustaches and sideburns were commonplace in the 1970s, and then designer stubble was popular among yuppies." But trends have changed and recent years are seeing a facial fuzz renaissance – fuelling the demand for barbers and male grooming services. It’s not gone unnoticed that beards are still at the height of fashion, particularly popular with fixie bike riding, Hackney hipsters and men in their 20s and 30s. However, it could also be argued that this trend is fuelling the industry. With more barbers offering beard maintenance as standard, the emergence of a new market for beard care products (combs, wax, oils etc.) and even a the development of 'beard culture' with magazines, books and events dedicated to it. 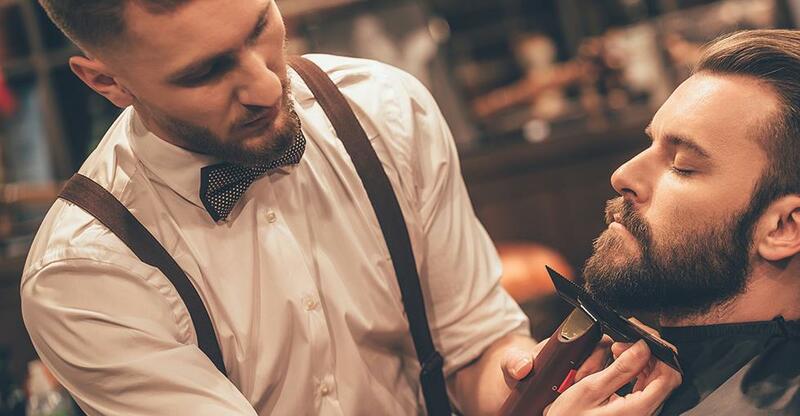 The bespoke barber is back, incorporating traditional techniques and specialising in cut throat shaves. The latest trend in the sector is a vintage / retro style with barbers shops are now paying homage to both fashion and film – anyone watching Mad Men? The dapper look has also made a comeback, with twenty-first century men wanting to emulate the expertly shaved, well-tailored dandy of the 1960s. According to the Telegraph, shops in ‘Europe sold £72 million less men's grooming products' in 2014 than in 2013. Selling a total of ‘£2.2 billion worth of shaving paraphernalia across the EU’ and bucking the beard trend. Driving the sales of moustache wax on a year on year basis is Movember. The worldwide charity event and men’s moustache movement encouraging men to grow a tash throughout November to raise awareness of prostate cancer. Prospective owners will need to check with their local council to see if they need to register their hairdressers or barbers, ensuring that they follow the health and safety rules (they may also charge a fee and inspect the premises). When the certificate is granted the shop owner will need to display the certificate of registration where it can be easily seen by the clientele. • Getting public liability insurance cover. It seems that abarber's is no longer just a place to get your beard buzzed and your hair chopped, cut or clippered - you can now enjoy an ice cold beer or a cocktail as part of the service. "I decided I wanted to be the middle man and offer them that and a place to get their hair cut. I've been doing it ever since." Jacks also offers a ‘media and gaming zone’ where customers can browse the internet, play PlayStation or watch the football while they wait. As the demand for barber shops continues to grow, it's an ever-evolving sector. Why not buy a barber's and re-vamp it for a thoroughly modern male clientele?